Delia Neal grew up in northern New Mexico and Southwest Wyoming before settling in Arizona in 1996. She attended Eastern Michigan University in Ypsilanti, Michigan on a Speech scholarship, where she competed with EMU’s National Championship Forensic Speaking Team, earning top honors in multiple events. She earned a Bachelor of Science Degree from EMU in 1989. 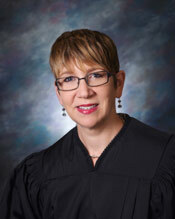 Delia returned to Wyoming in 1992 and entered law school at the University of Wyoming in 1993. While in law school, Judge Neal was involved with the Natural Resources Law Forum as well as Women’s Law Forum and Phi Delta Phi. She also worked in the Defender Aid program and Prosecution Assistance clinics. After earning her Juris Doctor in 1996, she relocated to Arizona and began working as a Deputy County Attorney for the Maricopa County Attorney’s Office in 1997 until 2001, when she left to serve as a Prosecutor for the City of Scottsdale. She worked in Scottsdale until 2006, when she was hired by the Pinal County Attorney’s Office before starting her own firm. In 2007, Judge Neal began working as a Special Master and Pro-Tem judge for Pinal County, she also served as a pro-tem judge in Maricopa County and the City of Scottsdale. In 2012, Judge Neal was appointed as a Superior Court Commissioner by then-Presiding Judge Robert Carter Olson. In 2016, Governor Doug Ducey appointed Judge Neal to serve as a Divisional Judge of the Pinal County Superior Court.